Be the first to share your favorite memory, photo or story of Gordon. This memorial page is dedicated for family, friends and future generations to celebrate the life of their loved one. 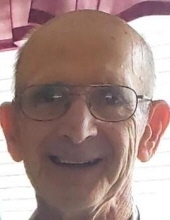 Gordon O’Dell, 80, of Leivasy passed away on Sunday, February 3, 2019 at Greenbrier Health Care Center, Lewisburg. Born on November 26, 1938, he was the son of the late Clarence and Icie McClung O’Dell. In addition to his parents, he is preceded in death by a son, David O’Dell; 2 brothers, Bradley and Harvey O’Dell. Gordon was a U.S. Air Force veteran and a coal miner. Survivors include his wife, Garylee McCombs O’Dell of Leivasy; daughter, Debbie Robinson of Craigsville, sister, Millie Smith; brothers, Clay O’Dell, Kenny O’Dell; grandchildren, B.J. Robinson, Justin Robinson, Robert O’Dell, Joshua O’Dell and 9 great grandchildren. Service will be 2:00 p.m., Thursday, February 7, 2019 at the Victory Chapel, Leivasy with Rev. Bradley Boyce and Rev. Stuart Stover officiating. Burial will follow at the Fairview Cemetery, Nettie. Friends may call at the church chapel on Wednesday evening 6-8 p.m.
Wallace and Wallace of Rainelle are in charge of arrangements. "Email Address" would like to share the life celebration of Gordon O'Dell. Click on the "link" to go to share a favorite memory or leave a condolence message for the family.